I took the XP Deus metal detector to the Iron Pit. The Iron Pit has become the proving grounds for all my metal detectors. The Deus p-owned the Iron Pit! I have said that I have hunted the Iron Pit until there were no signals left except ferrous signals. Then I took the Tesoro Compadre and was floored that I was able to get a few non-ferrous targets out of the Iron Pit. Well today, after work, I hit the Iron Pit with the Deus. In essence and for all practical purposes, the Iron Pit has become a live site again, with LOTS of non-ferrous signals. I even managed to get a silver earring! Not pictured are about a dozen pull tabs and beaver tails that were invisible to my other detectors. This was so loud and clear, a deaf man could have found it. 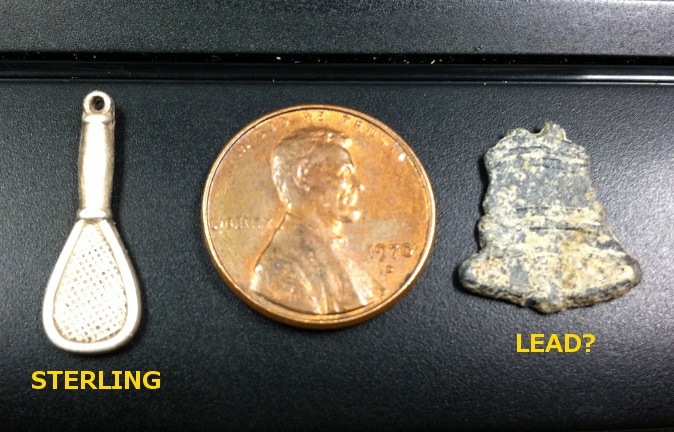 Getting non-ferrous targets from an iron-infested site with the Deus was like taking candy from a baby. I used the Deus Fast program that came installed from the factory. I am so excited at the prospect of gridding the Iron Pit with the Deus and seeing what amazing goodies I missed before. Oh, and I only took the targets that were easy to extract. I left many signals that were deep and will wait for me and the Sampson T-handle digger. 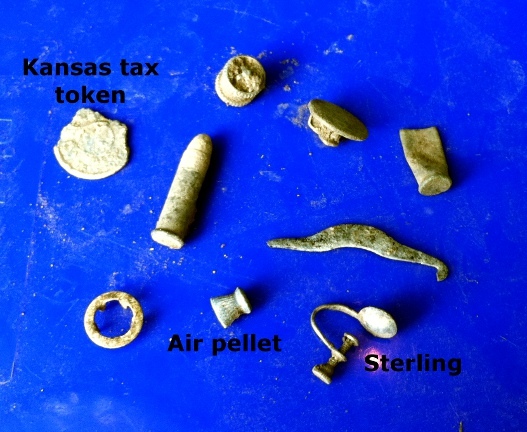 I went metal detecting with my Tesoro Compadre this morning. My intent was to clean an area at the park of any pull tabs within the first five inches of ground. A quick Google search reveals that this ring probably dates to the 40’s or early 50’s. 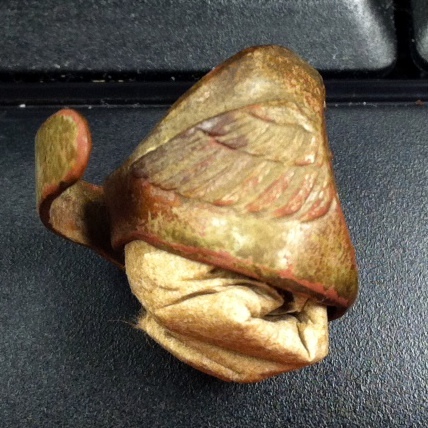 Some people suggest this ring may have come from a cereal box. 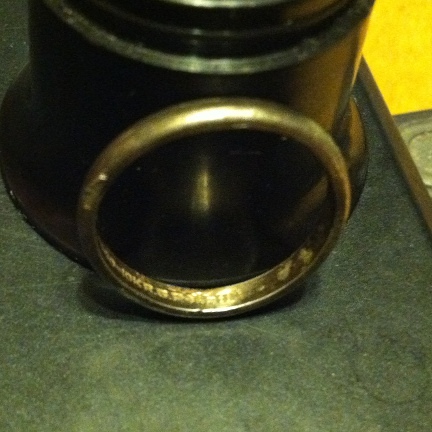 At any rate, rings are very personal relics and a ring like this always makes me wonder about the person who wore it. 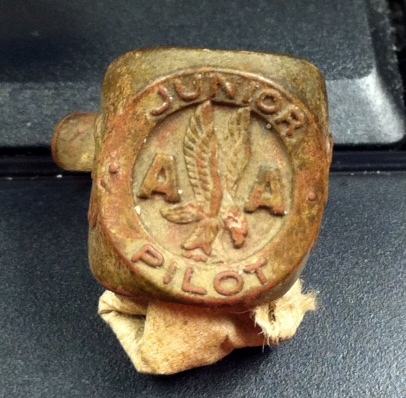 They also had Junior Stewardess rings for girls (it was the 50’s after all!) but I believe this ring may have belonged to a girl because a Girl Scout camp stood for many years where I found this ring. I wonder if the person who got this ring as a child is still alive. I wonder if they remember getting this ring and if they sometimes wish they hadn’t lost it. I think it’s a very cool ring. I continue on my quest for gold. I have decided to hunt for gold until I fill a gallon container with pull tabs and other mid tone targets. I am hoping to find a gold item before I fill the container with stuff but I am alarmed at how quickly it’s filling up! I am digging an average of 40 mid tone signals per hour. Meanwhile, I keep finding interesting stuff while digging for gold. Today at lunch, I returned to the Iron Pit. The Iron Pit is the name I’ve given the honey hole I found last Summer. Anyway, as I was scanning for mid tones, I got a foil signal on the AT Pro. The Target ID (TID) was 45 and the depth was two inches. 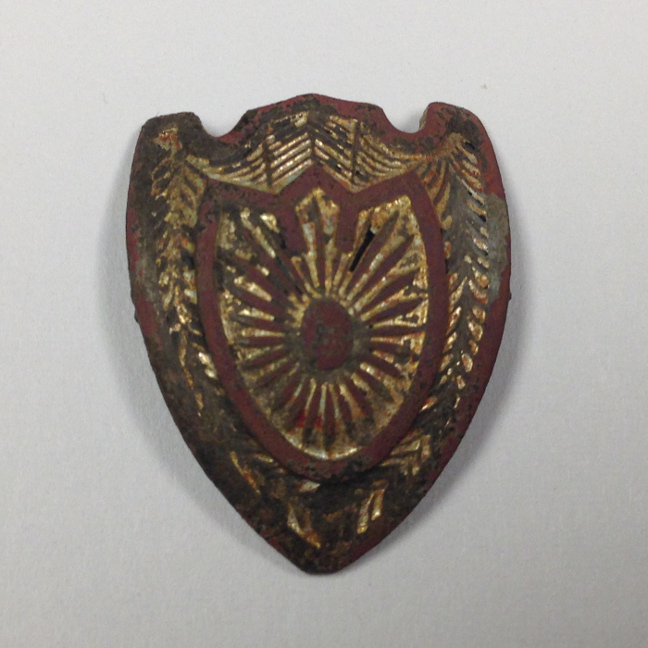 I dug up an old zinc or lead bell emblem that may have been part of a tag. Later, I got a mid tone with a TID that jumped from 49 to 50 and back. The AT Pro said the target was six inches deep. I began to dig the hole and just below the surface, I found a tiny tennis racquet charm. It looked pretty nice and silvery and I could see that it had a stamp. 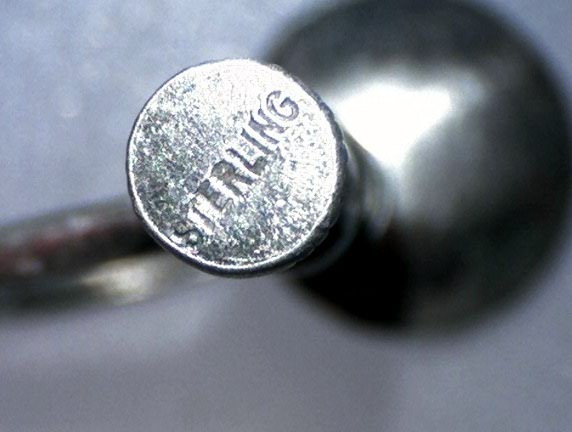 When I got to the car, I looked at it with my loupe and sure enough, the mark said sterling. 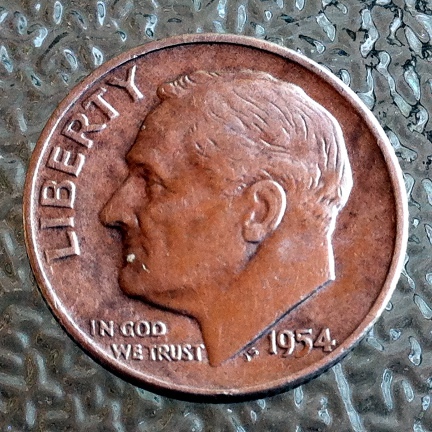 I am not surprised the charm read lower than a nickel. First, tiny silver can read like that. Second, with all the rusty iron at the Iron Pit, I expect the detector to get confused. So this makes me wonder about how many countless treasures I’ve missed in the year I’ve been detecting because I haven’t been digging mid tones consistently. Heck, for the first eight months or so I downright ignored all mid tones. And yes, I have to say it one more time: The Iron Pit doesn’t stop giving! I found yet another ring today. I hunted with my good friend Patton from the Friendly forum and at one point we were joined by another friend and hunter from the Friendly, Stevouke. I was hunting with the CZ-3D and toward the end of the hunt, I got a nickel signal. It was a repeatable high tone that sounded deep. The pinpoint verified that the target was six inches deep. 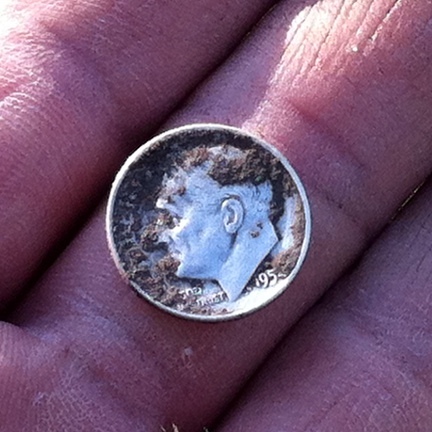 I was expecting an old nickel but instead, I found a ring at the bottom of the hole. The ring looked to be made from gold so I immediately looked for markings. The first thing I noticed was a 1/500. I didn’t need to look anymore. I knew this was a gold plated ring. The complete marking reads: 1/500 10K R.G.P. –>M-H. Seems like a lot of information for a plated ring. 1/500 gold. Does that mean his great-great-great-great grandpa was 100% gold? The mystery to me is; if gold is so stable, why do gold plated rings turn to muck under the ground? This ring retains the gold plating on the inside of the ring but it’s all gone from the outside. At any rate, I like that the CZ-3D gives a high tone on 90% of nickels and on about 40% of the square pull tabs, and since gold often comes in at those readings, I think more rings are on my future. While hunting the ghost town (now plowed under), the guy who invited us told me about Date Nails. It seems that the railroad companies would put a special nail on the railroad ties to date them with the purpose of knowing when to replace them. I had never heard of this before and I thought it was very neat. We walked along the railroad tracks looking at old discarded ties looking for date nails. 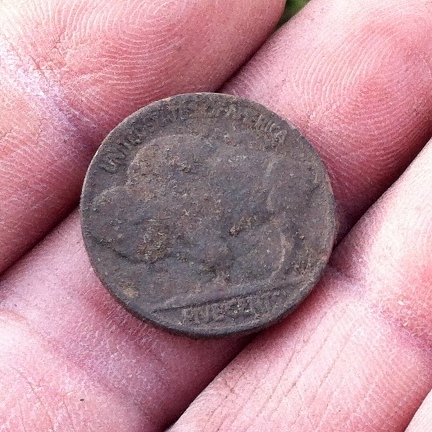 The oldest we found were from 1929. How cool is that!? 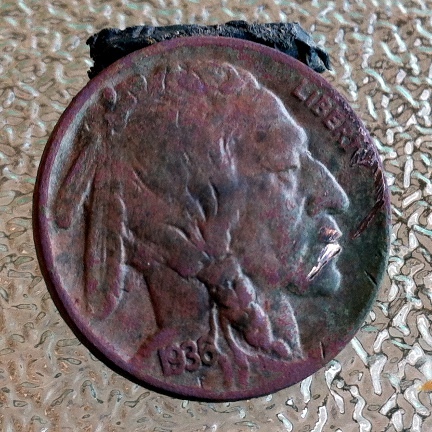 In 1929 a worker nailed this to the railroad tie. B) The ring was in the dirt for I don’t know how long so the abrasions may have come from that. Anyway. The thing that got resolved beyond doubt was what kind of stone it is. 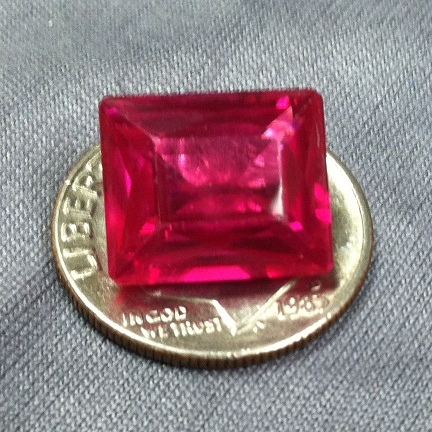 It is a ruby. Now, where do I sell it? After looking at the markings for a while it suddenly became clear what they say: HONG KONG. Although I see no evidence of plating, I will count this ring as plated as I believe that’s what this is. I am hunting with the V3i on Best Data. The 22.5kHz frequency and the 7.5 kHz frequency lined up but the 2.5kHz frequency was off on the rejected negative VDI range. When I pinpointed, the dominant frequencies were the 22.5kHz and the 7.5kHz very much even while the 2.5kHz was a small green bar. The ring was about six inches deep, which tells me it was dropped a while ago. I didn’t break the ring, I think it was a lawnmower casualty. I ordered my gold test kit and it’s here (less than $20 U.S. dollars with shipping). 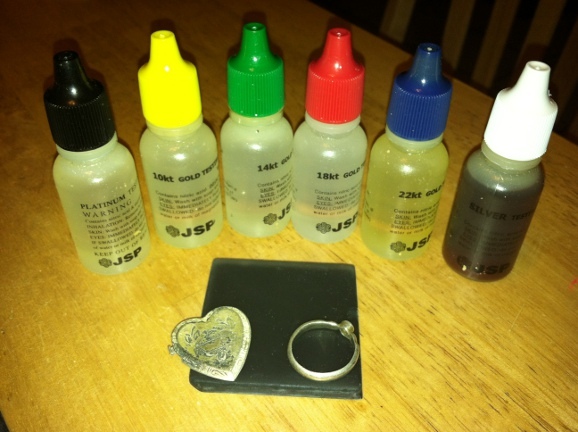 It includes acid to test silver and platinum. The reason why I needed this test kit is that last year I found two items that I believed were silver but had no markings. The heart shaped locket cover particularly bothered me because even though the detector reads it as a dime, when you drop it, it doesn’t sound like the silver rings I have. 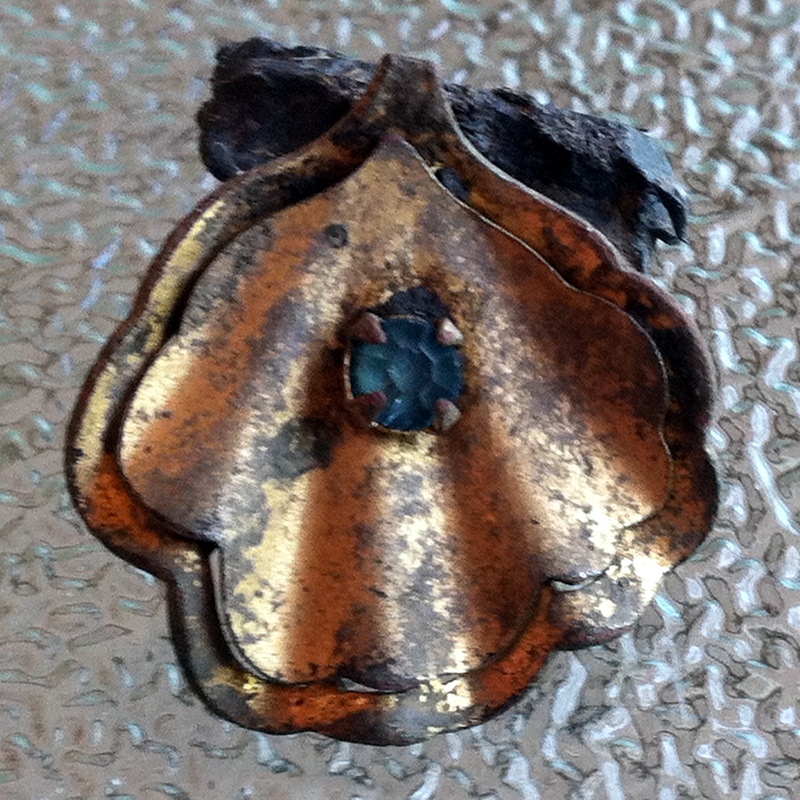 So I tested them this morning and I was surprised to find that the locket cover tested as 80%-90% silver. The ring tested at 90%-100% silver. I also tested my gold rings just to practice. No more relying on Pawn Shops to test my stuff! Acid acid on the wall, is this bling or is this gold?